Arnold, on the other hand, was much more concerned with authenticity and much less concerned with practicing. He seems to have been a Renaissance man - a Google image search turns of photographs of him playing keyboards, lutes, and wind instruments, and he not only performed but built all of them. With his interest in the instruments and performing styles of the past, he was a spiritual successor to the later HIP pioneers. It's too bad that Arnold and Wanda didn't get along - they would have made a formidable team. Bach felt quite comfortable with the vocal and instrumental types that were available to him, and if we care about performing his music as he himself imagined it, then we ought to restore the performance conditions of his time. 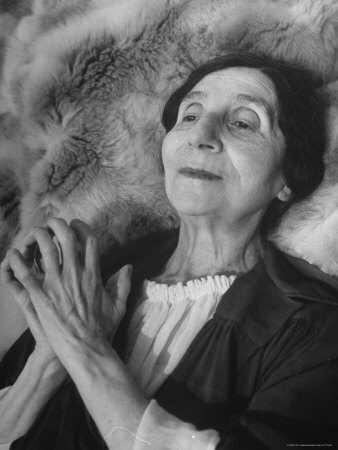 The first version, to my ears, is following in the footsteps of Landowska - rather sincere, profound, heavy, even. The second version is much lighter, free-er, and lilting - almost dancing. This is the result of 12 years of Leonhardt's personal experimentation and growing, but also the publication of primary source research such as Dart's Interpretation of Music and Donnington's Interpretation of Early Music. Every musical performance makes us reconsider our concept of the musical work. The effect of each performance, however, grows smaller as the tune develops a tradition. The initial performances have the ability to shift the "center of gravity" farther than can later versions, which literally have more tradition to move. There have been three dominant styles in the performance of rhetorical music in the 20th century. As the century began, Romantic Style held sway, but as the century ended, Romantic Style was all but extinct, and could be heard only on recordings. What evolved from and eventually replaced Romanticism as the musical mainstream? Modernism, with its emphasis on precision and relative emotional restraint. These days, if we go to a performance of Bach's Matthew Passion (canon, hello) we're likely to hear a Modern style or a Period style performance, Period style having splintered away from Modern style around the 1960s. The first two recordings are different from each other; this third sounds like it could be from another planet. That's Willem Mengleberg conducting Concertgebouw Orchestra and the Amsterdam Toonkunst Choir in 1939 - but the style goes back further than that. Mengelberg conducted the Matthew Passion every Palm Sunday starting from 1899. Listen to as much as you can - personally, the further in I get, the less insane it sounds - portamento and wild tempo fluctuations seem to amplify the emotion of every. single. moment. Check out the lead-in to the recap ~4:20 - 4:52, and compare to Solti ~3:30 - 3:58. It's a style from another era, but it's certainly not bad. In the next section, Haynes goes on to examine some of the characteristics of Romanticism and how it subtly influences musicians to this day. This is a luxury - for the first time, musicians of one period are able to closely examine music from an older, extinct style thanks to the advent of recording technologies towards the tail end of Romanticism (late 19th, early 20th century). He points out a certain melody-centrism that leads musicians to make decisions without fully considering the lower voices; particularly the bass line which is so vital to all rhetorical music. He also points out Werktreue, the idea that the true ideal performance is somewhere in the ether, and the related phenomenon of the transparent musician (the musician is only a vessel), and the reduction in improvisation. It certainly begs the question: What would Joachim and Moreschi have to say about Gould? "Style Is That Which Becomes Unstylish"
As in fashion, musical style changes at a rate roughly corresponding to its formality. The most formal dress for a fancy event has changed very little in a hundred years, just as the appropriate music for a graduation or a wedding has changed very little. On the other hand, casual weekend wear style changes every season, as does much popular music. Haynes compares the canonism of contemporary classical music with business wear - changing only in minute details like lapel width and number of vents - but in essence the same suit and tie from 100 years ago. Before Romanticism and Canonism, however, concert music was much less stable. I like the clever implication that Bruce makes here. If "style is that which becomes unstylish" and we currently have a situation where the dominant style of musicking is largely unchanging, that's basically the same as not having a dominant "style" at all. Contrast with the pre-Romantic approach, which was ever-changing and therefore Stylish! the Gothic period of the grey contrapuntists. Mattheson was happy to criticize Corelli, and Von Uffenbach was skeptical of Lully. It's tempting to look back at these writers (really, these Musickers) and laugh at their irreverence for the great masters but the clear overarching story is that innovation was king for hundreds of years before the Romantic revolution. J.S. Bach, one of those great masters himself, is on record being astonished by the rate of change in musical taste. Back to business: after the 18th century, Romanticism was the dominant style (can we call it a style?) and mainstream musicians to this day emphasize the conservation of this great romantic tradition. We even learn it in conservatories (all founded in the 19th century). More than a few pianists make a point to trace their "lineage" back to Beethoven. Innovation takes the back seat. Bruce Haynes ends this section with an intriguing little insight that is destined to be expanded upon - that the Romantic tradition of performing is much less pure than most musicians assume, and that it is helpful to call out the 1960s as a rough inflection point. Around that time, music started to splinter - increased ethnomusicology raised awareness of geographical style, the beginnings of HIP raised awareness of rhetorical style, and the mainstream thoroughly embraced a style Haynes differentiates from the Romantic, and instead calls "modern." I would guess that whoever wrote these words believed, like a number of theorists these days, that a piece could reach its final form without being performed. It is amazing that anyone could mistake a piece of paper for music, but that's what happens when you get super-literate. Ouch. But we've come around again on universal literacy causing canonism and text-fetishism. Marks on a page being confused for music. Those marks on a page aren't music, just as a recipe in a cookbook isn't dinner. Performers (and chefs) matter. It was the dominant view from the Romantic revolution at least through to the 1960s, that music was an unbroken lineage. The musicians of a time would have inherited certain traditions from their teachers, and their teachers' teachers, and had a sense of ownership and a certain freedom with the music of the past. This is how Mendelssohn came to lead a massive force of 200 performers in Bach's St. Matthew Passion or how Wagner came to make multiple (sympathetic) corrections to Beethoven's Ninth Symphony. The tradition was there, so how could it be a problem? I love the next circle-about by Bruce Haynes: the fact that ethnomusicology and historically-informed performance both took great leaps forward in the 1960s was no coincidence. Both reflect a wider trend in society towards pluralism - a common interest and sensitivity toward countries, cultures, and times not our own. The fact that traditionalists remain is clear, but their "mainstream" is shrinking rapidly as a whole plethora of new areas are expanding. The historical approach - that of questioning and inquiry and expansion of knowledge - is growing, while the "inherited tradition" isn't. It's an exciting time!